Hagenberg, Austria - December 03, 2007 - Ergonis Software is all set to celebrate the 20th anniversary of PopChar, the award-winning tool for inserting umlauts and special characters into the text of any application. In celebration of this anniversary, customers can save 25% off the regular price when they order PopChar during December 2007. Effective immediately, any order for PopChar X and PopChar Win placed on Ergonis' online store before the end of the year will receive a 25% discount. The special offer applies to new licenses as well as upgrades and is available only at Ergonis' online store at www.ergonis.com/store. "We are happy to celebrate PopChar's 20th anniversary today," said Christoph Reichenberger, founder and CEO of Ergonis Software. "It all started with a small system extension my partner and friend Guenther Blaschek wrote for his own during the time when we were colleagues at the University of Linz. Now, 20 years later, we are running our own company, knowing that PopChar runs on hundreds of thousands of Macs in over 100 countries all over the world. It couldn't have worked out better." "I wonder how many of today's PopChar users still remember System 4.2" said Guenther Blaschek, author of PopChar and CTO of Ergonis Software. "PopChar has been running on all Mac OS versions from 4.2 on the Mac Plus to now Leopard on Intel-powered multi-processor Mac Pros." "When PopChar 1.0 came out 20 years ago, I immediately saw how much easier it was to use PopChar than the Apple Key Caps utility. 20 years later with Mac OS X 10.5.1, the need for PopChar has not diminished but rather increased due to the huge number of non-alphanumeric glyphs 'hidden' in fonts these days," said Charles Ying, chairman of Bitstream Inc. and Instigator of MyFonts.com. "Using fonts on computers today without PopChar would be like buying a 4 bedroom house and not knowing how to find 2 of the bedrooms. Congratulations to Ergonis Software on reaching such a rare milestone for a piece of software." PopChar solves a problem faced by every technologist and multi-lingual worker. Inserting special characters into application documents can be frustrating and results in a steady loss of productivity. 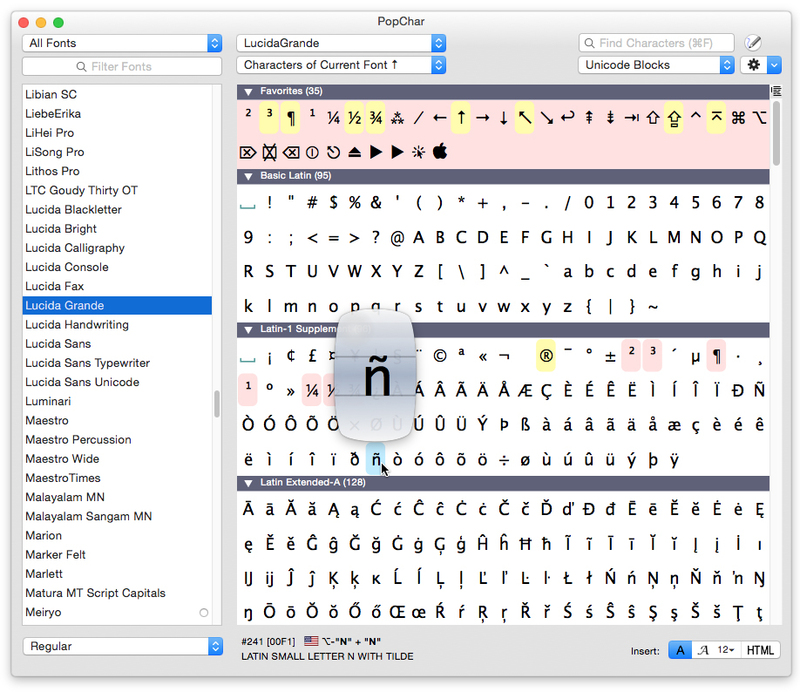 With PopChar you no longer need to search for and remember keystrokes. Just pop up the PopChar window, click the desired character, and the character appears in your current document right away. Visit Ergonis Software's website and try the current version 3.3.1 of PopChar X that has been released today. PopChar can be purchased securely on the Ergonis Software website. Any order for PopChar X and PopChar Win placed on Ergonis' online store during December 2007 will receive a 25% discount when the order is processed. For information about purchases, including enterprise licenses, volume discounts, and upgrade pricing offers, visit the Ergonis Software website. Ergonis Software develops ergonomic and intuitive software that boosts the productivity of Mac and PC users. Ergonis Software, a privately held company founded in 2002, is headquartered in Hagenberg, Austria.